Each year our Orphan Hosting team has the opportunity to meet some of the most amazing and kindhearted families in the world, as they work together to bring children to America with the hope that they will find their Forever Families. Among these families from our 2015-16 Holiday Hosting program were “K” and “C,” a couple that welcomed a little girl named “L” into their family for four weeks. During their time hosting “L,” the two fell completely in love, immediately beginning the process to bring her home. 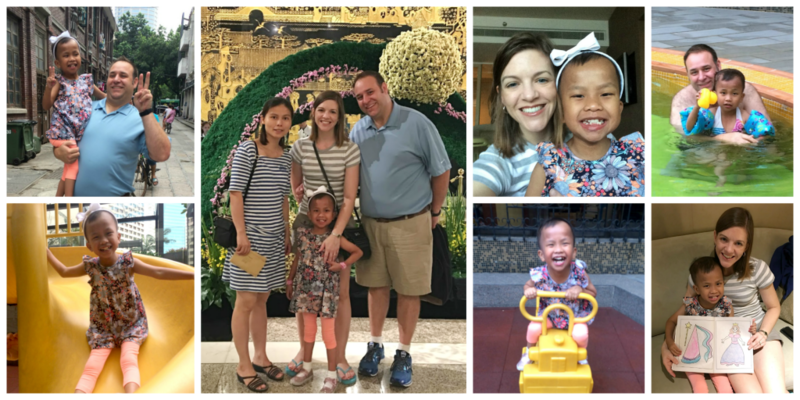 Now, less than one year later, they’re in China finalizing their adoption and welcoming their daughter into their family forever! 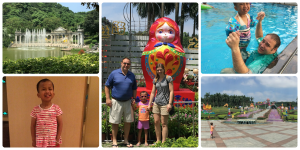 Here are a few of their most recent blog posts from their trip. Check back soon for updates! Today we were reunited with L at the Civil Affairs Office. Our guide, Kelly, helped us with some paperwork and we waited with several other families. She walked out wearing a beautiful white dress, pink headband, and pink sparkly shoes. She was immediately happy and smiling and called us mama and baba. We spent time looking at old pictures and videos on my phone. She keeps asking for Kinsley and wants to call her. We had to tell her she was asleep. She keeps says, “sshh Kinsley sleeping.” In the van on the way back to the hotel, she asked for jewelry and painted nails. This girl didn’t skip a beat and we picked up right where we left 8 months ago. Back at the hotel, she found her new shoes lined up against the way and immediately had to change. She had some ramen noodles. It seemed like she was starving and had two helpings. I delayed showing her her drawer full of clothes knowing that would instigate a wardrobe change. She pointed to the drawer all on her own and wanted to change. She pulled out several outfits but settled on a jean jumper. She also was focused on when we would be painting her toenails and fingernails so we accomplished that. Only tears were when we were running down the hallway to the elevator and she slipped and fell. The tears were pretty short-lived. We ran up to the lounge so C and I could grab something to eat for dinner. And she had a few snacks. Our evening was spent playing Candy Land, taking a bath, and reading books. A very successful forever family day! 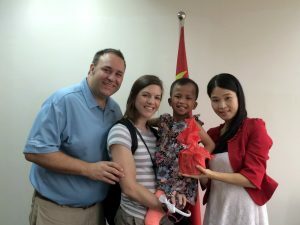 So today we finalized our adoption as far as China is concerned. Today K’s sister, Lilly, was our guide. She was very engaged with L. Lilly asked her lots of questions and she answered. This is by far the most we have heard her speak. The great part is Lilly was able to translate for us during our van ride to the Civil Affairs Office. She told Lilly that she wants to be adopted and live in America. Sounds good to us kiddo. We met with two different female officials who asked us questions and completed our paperwork. We are approved and they are working to issue our final certificate. After returning to the hotel, we let L explore the garden of the hotel, which includes the waterfalls and coy fish ponds. She also walked by the pool and spent a lot of time the playground. She loved going down the slide, especially if one of us startled her on the way down. We walked to an Italian restaurant for lunch. She ate some beef spaghetti like a champ. It was so hot and humid today that we were all drenched in a short period of time. The pool was calling us but we agreed that nap time was probably more important. Unfortunately, it was raining with thunderstorms whenever she woke up so we had to delay it. We played in our room and the beach ball I brought along was a huge hit. The rain cleared so we were able to “go swimming” in the kiddie pool. We had dinner in the lounge here at our hotel and we have found that our girl has a deep love for prawns. We have no idea if this is something she had at her orphanage, but we doubt it. This was the one thing she picked out as we walked through the spread. So I spent most of my dinner, cleaning, peeling, de-heading, and deveining shrimp. She is not a fan of cocktail sauce after trying it and telling us it was hot. Last night, she had two shrimp. Tonight she devoured four large shrimp. We had a low key evening in the room and did some coloring. I see significant improvement in staying in the lines. We are also really impressed by her speech and vocabulary. Today was another great day of making memories. After breakfast, our official business for the day was having her medical exam completed which is one of the requirements to finalize the U.S. portion of the adoption. 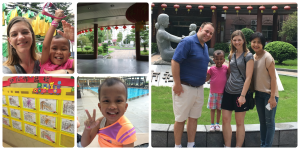 Our guide, Kelly, took us to the Guangdong International Travel Healthcare Center. First, L had her photo taken for her Visa. Then we went upstairs to the medical clinic where she made friends with everyone. The measured her height and weight, checked her eyes and ears, drew blood for her TB test, and did basic medical exam. Similarly to when she visited the U.S., she did not cry when they drew her blood. She has had a nasty, deep cough the last couple of days that we have been treating with over the counter meds. She was also a little lethargic this morning and has been running a fever on and off. Despite not feeling 100%, she has continued to be her happy and pleasant self. They prescribed an antibiotic because her throat was red and inflamed. She has had one dose so far and it seems to be helping. We ventured out for lunch and went to the Noodle House near our hotel. Of course, she selected a picture with noodles and shrimp. She ate the best we have seen so far. We stopped by the playground to burn off some energy. When housekeeping came to clean our room, she watched intently and brought her one of the trashcans. She seemed concerned that they were removing the linens from our bed. She kept putting her hands on her hips and looking at me like “aren’t you going to do something? !” We have also noticed she is highly organized. Always wanting to put back what she has been playing with and straightening and organizing the shoes by the door. Today we had another free day. At breakfast, we were reunited with the new friends we made at last night’s reception. We spent time playing on the playground and hung out in our hotel room. The days are going so fast and yet we are so ready to be home. This afternoon our guide, Kelly, took us on a shopping trip. Our first two stops were to pick up some traditional souvenirs. Common purchases are jade and pearls. She took us to the pearl market which was a multi-level building with literally hundreds of wholesale vendors. All types of jewelry were available. Our excursion turned from shopping to learning pretty quickly as she walked us through several local “markets.” We walked along a pedestrian only street that was filled with people. She said Guangzhou has a mere 16 million. The street was lined with clothing stores. We turned down a side street and entered the “pet market.” This consisted of a whole section of vendors selling cats and dogs in crates. Then we entered the “herbal medicine market.” We saw all sorts of things but the worst was the bins of creepy-crawly scorpions. I still have creepy-crawly skin just thinking about it. Next, we visited the “food market.” Shoppers could buy fruits, vegetables, and meat. We saw a lot of fish and black-skinned chicken which is used for soup. Our senses were on overload with all of the unusual smells. She said it is common for younger people to shop at Walmart but people her parents’ age prefer to shop at the local markets. We opted for McDonalds for dinner and also enjoyed some ice cream. Our two extra value meals and happy meal were less than $10 USD. As soon as we got back to our room, L thought we needed to eat again so we headed upstairs for a nightcap of shrimp. Today started out very early as we prepared to travel an hour and a half to Dongguan to L’s orphanage. It was an educating day and one filled with lots of emotions. We have been told it is one of the better orphanages which is mildly comforting. Due to the long drive, L had some carsickness but once we gave her some medicine she slept the whole way. As we drove up, the main building looked very nice. L was an obvious favorite as many of the adults (nannies/caretakers) knew her and were excited to see her. As we walked around, we noticed how bright and colorful everything was. There was a lot of natural light and it seemed like a good environment for learning. We were able to see the sleeping area with bunk beds, bathroom, and classrooms. We saw a few older children but most were very young. We were told most of the school-age children were at the Sunshine Academy, a school affiliated with the orphanage but a few blocks away. One of the caretakers told a story that when L was younger, she would get up in the middle of the night and make her self a bottle when she was hungry (even when she was too old for a bottle). They all got a good laugh reminiscing about her. L seemed to show minimal emotion during our visit. So we started asking some questions and learned that once the young children can take care of their own basic needs they are moved to a different building. Then they estimated that it had been three years since L had lived there. They explained that she was living in an outside dormitory. It isn’t a foster home but basically a small orphanage, maybe only 15 kids, with two to three nannies in a building offsite. Although we didn’t get to see where she lived most recently, we did see where she spent a lot of time. L slept again on our return trip and we ate a late lunch at an Irish Pub. We both ordered cheeseburgers and ordered spaghetti for L. It wasn’t quite an American cheeseburger but the french fries were great. L didn’t want anything to do with the spaghetti and instead ate off of our plates. I even convinced her that coleslaw was noodles and surprisingly she ate it. We decided it would be another great day to go swimming. The kiddie pool was closed today so we had to swim in the big pool. L was quite the fish. She loves watching the other kids and thinks she needs to put her face under the water too. She was much more relaxed and really seemed to enjoy kicking and splashing around. We had another low key day today. We visited an H&M store right by our hotel and L enjoyed trying things on and having a fashion show. We also walked to Martyr’s Park which is several blocks from our hotel. Our hope was that L could play on the children’s playground. It rained on and off but we still enjoyed our afternoon out and about. The park was beautiful and the pictures do not really do it justice. The park included monuments, temples, tombs, pavilions, and a cemetery. There was live music playing in several areas, but the children’s playground was lacking so L just rode around in the stroller. Tonight we went on a river cruise with two other adoptive families from our hotel and met several others there. The cruise consisted of riding on a boat for one hour and twenty minutes up and down the Pearl River. It included a dinner buffet. The guide told us to eat as soon as we could and not to wait. There was no organization or line formation; people would just go to the dish they wanted and often would remove the serving tongs to take to their next dish of choice. It was crazy. The food was okay but not anything special. The kids all seemed to love it. Leave it to my child to select chicken feet and proceed to eat them. It was disgusting! Our table was on the second level and after dinner, we were able to visit the open third deck to take photographs of the City at night. There was also an entertainer which made the children balloon animals and juggled. Many of the kids got to be part of the show. L really seemed to enjoy the evening with friends. Today was another free day for us. After breakfast, C and I got foot and shoulder/back massages. They applied much pressure but we felt very relaxed afterwards. L pretended to help and she was very patient. We grabbed lunch at OGGI which is a pizza place. It was a nice change and even L seemed to enjoy it. We did some boutique shopping near our hotel. L had fun trying on different dresses and twirling around. We were trying to kill some time because it was raining again. We were getting close to time on when we were supposed to be meeting our guide for sightseeing and it was not letting up at all. So we had to run several blocks in the pouring down rain back to our hotel. There were several inches of water in the road because the rain was coming down so quickly. By the time we made it back, we were all drenched! Our guide, Kelly, took us and another family to the Chen Clan Ancestral Hall which is a family temple and not religious at all. It was one of the few activities we could do because it was partially inside to protect us from the rain. 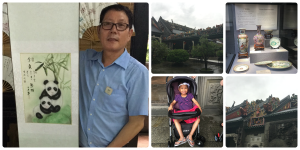 We toured the temple and viewed the intricate displays of wood carvings, porcelain painting, ivory carving and more. There were also several souvenir shops. After we were finished, we visited OneLink Plaza which is a multi-level wholesale toy market. It is a misnomer because they actually have many items in addition to toys (household, gifts, etc.). There were literally thousands of vendors. We wondered around and did some more souvenir shopping. It was great to be inside and out of the rain. 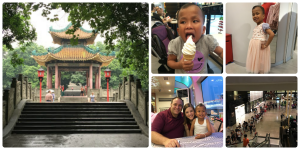 We stopped at the Guangzhou Friendship Store and ate dinner at a place called the Banana Leaf. They serve Thai food and L was thrilled to be eating noodles. This girl requests to eat noodles all day long and generally eats 3-4 servings per sitting. 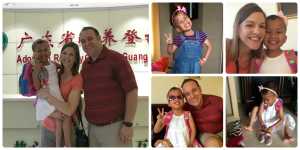 Today we had our U.S. Consulate appointment to finalize L’s adoption. We were there with many other families who have become friends. Unfortunately, our bag and phones had to stay at the security checkpoint so we were not able to take any photos inside. All of our paperwork is finally finished and we will receive her VISA tomorrow. As soon as she lands on U.S. soil, she will be a U.S. citizen. Afterwards, our guide, Kelly, took us and another family to Yuntai Garden. The park was really beautiful and full of bright, vibrant colors. This was our first day here that it has not rained which was nice but it was extremely hot and humid. After a short stroll around the park, we were ready to be done with sightseeing. We decided to spend some time in the pool. L likes to “swim,” put her head under water, and today C taught her how to blow bubbles. We headed to dinner with our favorite hotel buddies. We went to an Italian buffet and L ate really well (3 plates full). The kids had fun playing together and I’m sure are going to miss each other when it is time to part ways. Speaking of which, we begin our trek home tomorrow. It has been an enjoyable trip and great bonding time, but we are beyond ready to be home. L wants to ride the airplane home everyday although she is not too eager to see Bessie, our dog. We are so appreciative of all of the thoughts, prayers, and supportive comments during this journey to bring L home as our child.